As the man exited the car, he drew a pistol, grabbed the officer, used him as a shield and demanded that the officer’s partner hand over his weapon. The partner, never having received training for such an event, made a decision. He relinquished the weapon. His partner was assassinated on the spot. As the assailants pumped multiple rounds into the officer’s body, his partner took the opportunity to flee on foot. He ran five miles before finding a farmhouse where the residents called for help. This crime, which began at 10:00 PM, was solved with the arrest of two suspects within hours. The surviving officer remained on duty through the night and well into the afternoon of the next day as he related the events and gave statements. The following night, less than 48 hours after having been abducted and witnessing his partner’s execution, he was back at work. He had already heard some of the rumors, questioning whether he had done enough to prevent his partner’s murder. At roll call, the sergeant asked the officer to stand before his colleagues and explain “how you guys fouled up” and “the things each of you did wrong, or what you didn’t do and should have,” as reported in Law Officermagazine. Supervisors then assigned him to attend other roll calls to repeat his story over and over. This officer received no psychological counseling from his department. He began receiving mail at home questioning his actions and calling him a coward. He testified more than a half-dozen times regarding the incident as he continued to struggle with his partner’s death and his own actions. After three years, he resigned from the department in disgrace, following an arrest for shoplifting. It was determined later that the shoplifting was a result of issues related to the murder of his partner. Today, we would call it Post Traumatic Stress Disorder. Ian Campbell was the young father and Los Angeles police officer who was murdered in an onion field by Gregory Powell. Karl Hettinger, Campbell’s partner, was the other victim of the crime, as well as his own department’s failure to “back him up” after the incident. It’s a rather famous case memorialized in the book and movie by Joseph Wambaugh, The Onion Fields. Campbell was a hero. More information can be viewed at http://www.odmp.org/officer/reflections/2723-policeman-ian-j-campbell#ixzz2vskALps9, the Officer Down Memorial Page. Be sure to take a look at the comments section where a granddaughter posted a message just a few days ago. 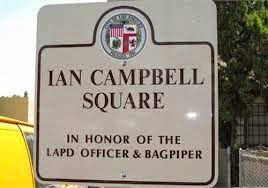 Campbell’s name has also been memorialized in Los Angeles by the naming of the intersection of Gower Street and Carlos Avenue, where he patrolled, Ian Campbell Square. Karl Hettinger was a hero as well. He made a decision that he believed was most likely to preserve his partner’s life that night by giving up his weapon. His decision may have been influenced by the fact that within the six weeks preceding his partner’s murder, there had been three other cases of officers having been taken hostage, all ending with their release unharmed. Gregory Powell and Jimmy Smith were convicted of the crime. Both died in prison, Powell, the shooter, at the age of 79. He was denied parole eleven times. At one of those hearings, Karl Hettinger testified, “I still get uneasy….I still can’t sleep very well. I can still see their faces.” Hero Karl Hettinger died May 5, 1994 at the age of 57. Today officers are provided with psychological services after being involved in traumatic events and there is survival training available. But the one thing that today’s officers should always remember is that harsh judgment of the actions of your brothers in blue during a crisis can have life-altering consequences. As an officer once said, “You would have had to have been there yourself to know for sure how you would have reacted.” Few have experienced what Karl Hettinger did. Note: I invite you to explore my three novels (available on this page in paperback or Kindle) about police officers, crimes and criminals. Thank you. Fascinating Smith. What I thought unbelievable, however, was that Smith was initially released in 1982. He eventually died in 2007 in a detention facility for violating parole. But, why he was released seemed to make no sense.